It is our pleasure to introduce our selves in the field of sporting goods. 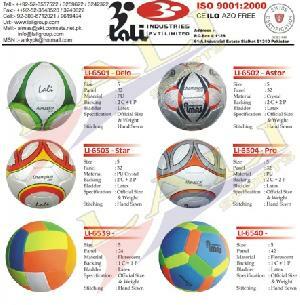 Lali Industries (Pvt) Ltd.
is a group of companies, is one of the world's leading Manufacturers of hand sewn/stitched footballs / soccer balls Located in the world's capital of sports balls manufacturing city Sialkot, Pakistan! Established in 1961.
we are iso9002 certified and produce chid labour free products. We take a strict stance against child labor and strive to eliminate the practice in the sporting goods industry in Pakistan. Lali Industries (Pvt) Ltd. Balls Manufacturing Production: Footballs / Soccer Balls, Hand Balls, Punching Balls, Rugby Balls, Volley Balls & Mini Balls. Panels: 12, 18 and 32 panels. Weight: 32 panel Footballs / Soccer Balls range in weight from 280 to 450 grams. Stitching Material: Thread tear cabled nylon 6.6 or equivalent full section crossed or acrylic rot proof. We also deal Sporting Goods Like: Boxing glove sets, sport gloves of all kinds, tracksuits, jackets and T-Shirts in all type of stuff. 1) Our products have been proved EN-71 PART-1, 2, 3 and 6. Azoic Free Ink. PAH Search. Six Phthalate (DBP, DEHP, BBP, DINP, DIDP, DNOP)from world famous BioLab. Italy. We affirm our guarantee against any legitimate manufacturing defects. All goods are free from any hazardous elements as we use non-toxic coating ink of Byre - Germany quite safe for any hazardous manners. 2) 1st Grade selected material is used in all production. No recycling material is used. Therefore we are optimistic that you will enjoy our quality standard in un-beaten prices. Kindly confirm the same so that we may send samples for quality evaluation and oblige. "trust of a client is our honor. service to the satisfaction is our pride"
Company Name: Lali Industries (pvt) Ltd.